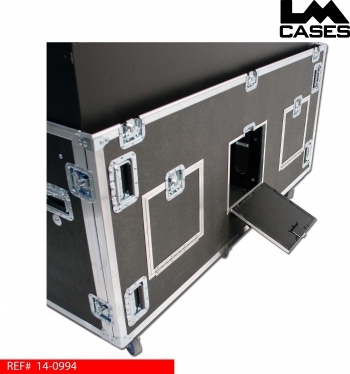 This case was designed for use as a portable video switcher workstation based around 2 - 21.5" iMacs. 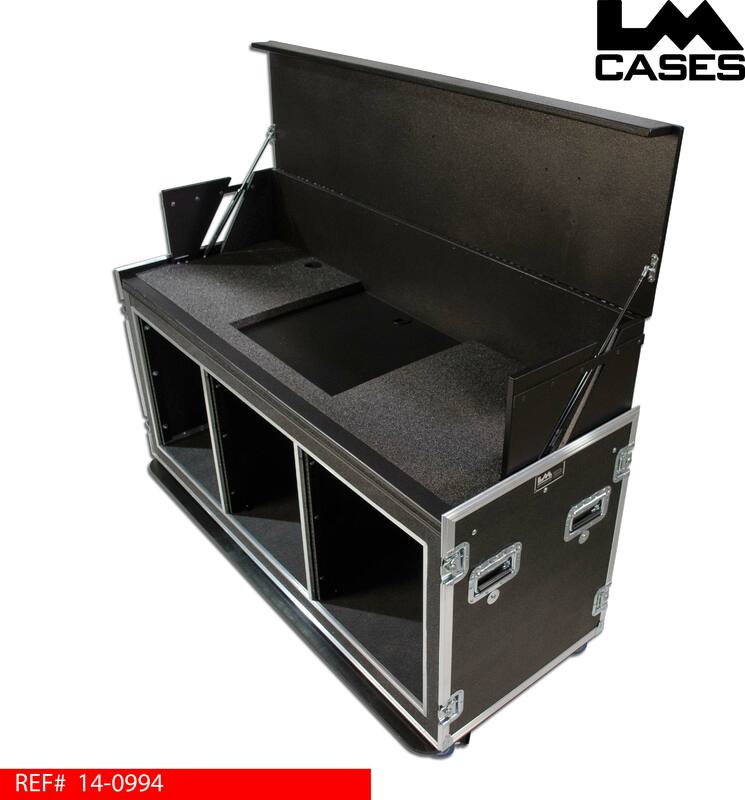 The case holds the iMacs and a Dell E2014 monitor on a custom flip up lid that is supported by HD gas springs. 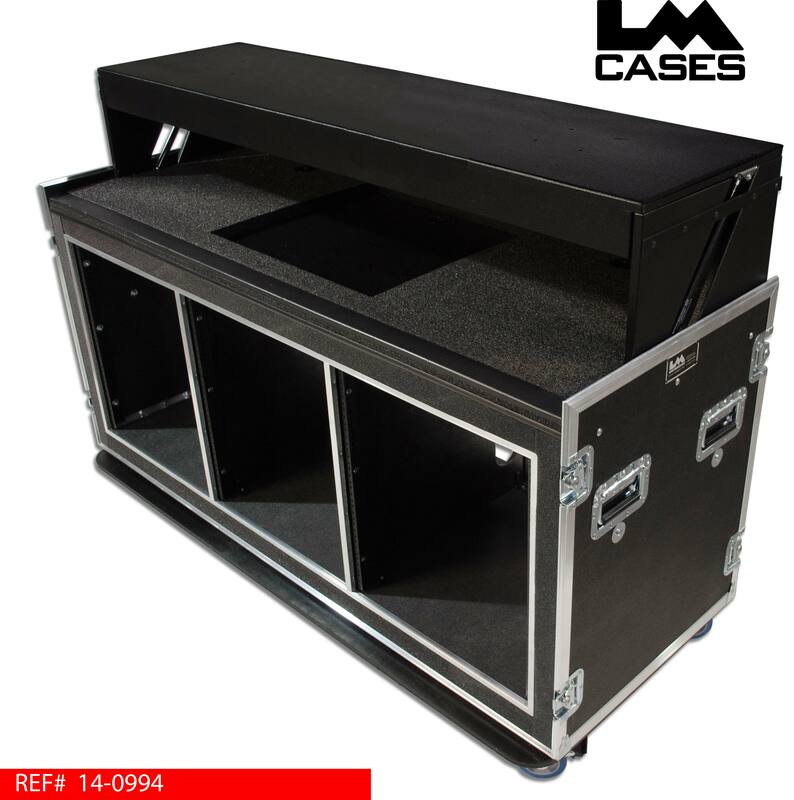 Below the monitors is a work surface that provides a home for keyboards, mice and a video switcher. Below the work surface is a triple wide shock mounted 12RU high rack that accommodates a total of 36 rack spaces. 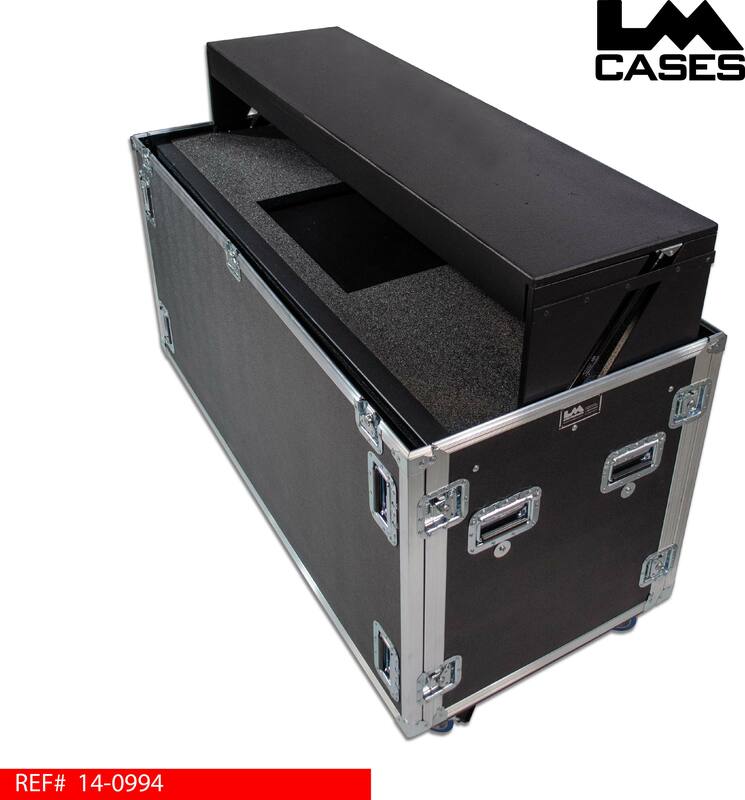 The flip up monitor board and chassis is built out of 3/4" Baltic birch and is finished with black texture coating. The computers and monitor are supported by two HD gas springs that allow the board with 3 mounted screens to rise without much effort. The spring load rating was calculated to allow the board to remain open and closed without the need for latches. 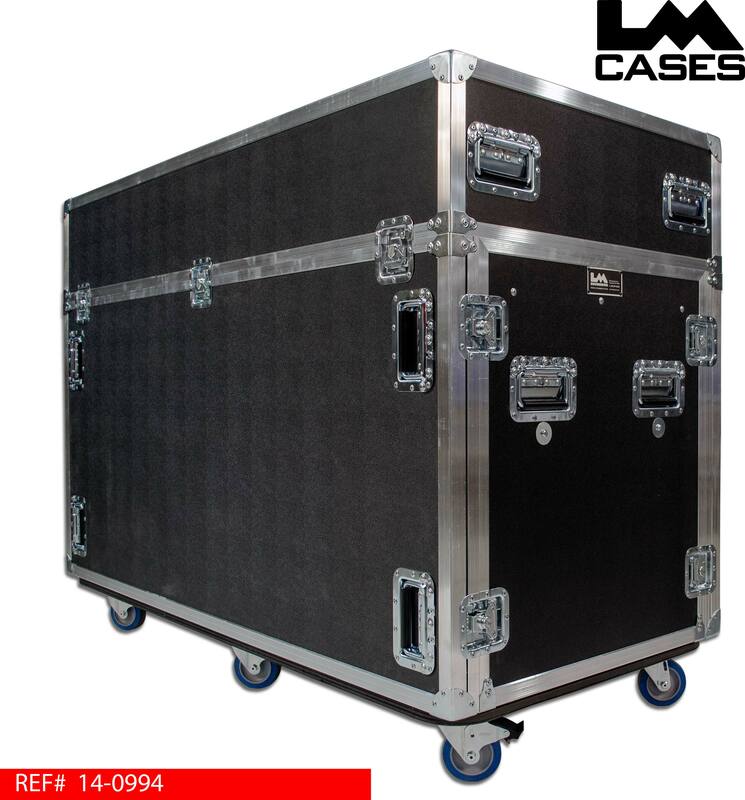 The switcher is mounted to a piece of 1/2" marine grade plastic, the remainder of the work surface is finished with 1" PE foam per the customer's request. 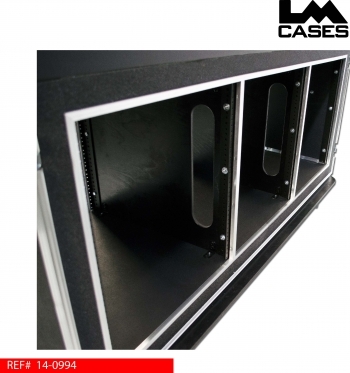 Below the work surface are 3 shock mounted 12RU racks, the racks feature front and rear pre tapped 10/32" rail with a rail to rail distance of 23". 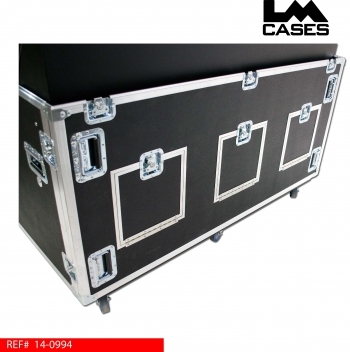 The case features a front, rear and top lid; the rear lid has 3 separate trap doors in it allowing connections to the racks to be made without removing the rear lid. The case is built out of 3/8" plywood laminated with black ABS plastic and features 4" Colson casters and deep recessed handles.